DJ B is in the house. Arrived on Sunday 16th July 2006 at 1.07a.m., weighing in at 7.12 pounds (3.53kg) and 58cm long (the mid wife referred to him as a giraffe). 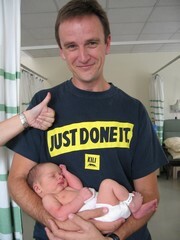 Thanks to all the doctors and nurses at Maidstone Hospital for all your help in the delivery. Here’s more pics of the delivery of Daniel Byrom as well as some pics of my wife, Cindy Byrom, having her baby shower. Daniel is our first son and I’m looking forward to introducing him to blogging if that’s whats its still being called when he starts making use of computers and the internet. At least this blog entry will be enough to take his name to the top 10 in Googles SERP (Search Engine Results Pages) as evidenced by this Google Search for Daniel Byrom.